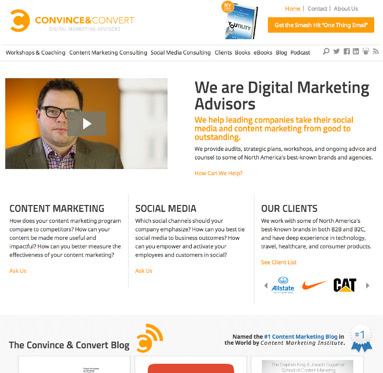 After a long gestation, I am delighted that we have launched the new ConvinceAndConvert.com site. We don’t change our stripes here all that often (every couple years or so), and I try to have a rationale when we do. 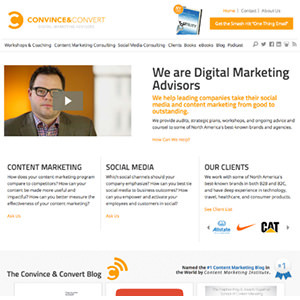 Since almost day one, the Convince & Convert blog has been the home page for the site and for the company. With our consulting business growing quickly, it was time to create a true home page that describes all the things we do here (consulting, training, blog, podcast, email, ebooks, books). Plus, even though Convince & Convert is a company of eight people, I wanted to make sure people still know that I’m personally very involved. So, there’s an intro video from me right in the middle of the home page. (for more on how we operate virtually and a lot of other “did you know” stuff, check out this ultimate FAQ about our business, and business model). High five and huge thanks to Mikey Mioduski of Mioduski Design for his great work on the new site layout (and also the new JayBaer.com site). It started with no expectations, but the weekly Social Pros podcast has become one of my favorite ongoing projects, and has also proven to be one of our most important content marketing and sponsor assets. The new site gives us a spiffy new podcast index page, and outstanding new formatting of the podcast-related blog posts. The previous site wasn’t bad when viewed on a smartphone, but it wasn’t great. This design is great. You lose very little impact (and no content) when accessing this site from any device, on any platform. Very, happy and proud about that. Terrific job by Greg Taylor and Jeremy Scott from Marketing Press in making the mobile version work so well, and for a ton of great work on the development of the site overall (more on that below). Partially due to the design and partially due to the very broad audience we attract here, we don’t have a site (historically) that is as sticky as I’d like it to be. Average length of stay is not where I want it, and the new design is set up to make it more comfortable on the eyes, and to more seamlessly recommend other content to you. Partially through the featured posts widget top left, and also through some “you might also like” tools at the bottom of each post. Right now, we are using Disqus for that, but we may be implementing some other technology to recommend posts. Stay tuned. Like many blogs that have thousands of posts, we had gotten some creep in our categories. Lots of categories were out-of-date, scarcely used or ill-begotten from inception. 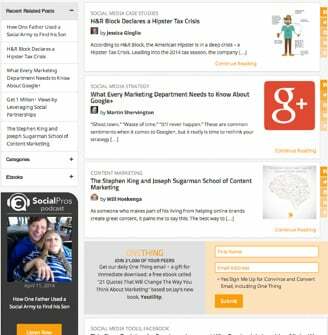 We reduced the number of categories significantly, and mapped all old posts to this new group, which required a ton of crafty 301 redirect work from the folks at Marketing Press. Thanks guys! In addition to the blog category sub-nav and fly-out menu, we also cleaned up the top navigation and made it more obvious what we offer from a consulting perspective. I also rewrote the main pages like social media consulting, content marketing consulting, and workshops and coaching to make them more consistent, and to more succinctly explain what we do, and what it costs to have us do it. We’ve also been almost bashful about talking about our clients at Convince & Convert, so we addressed that this time by moving clients into the main navigation, totally redoing the clients page (organizing them by industry), and adding a clients carousel on the home page. We also wanted to make sure that our colossally awesome Managing Editor, Jess Ostroff, could shave some minutes off of some of the repetitive tasks she performs to keep this site rocking and rolling with 8 blog posts, 6 emails and a podcast every week. The Marketing Press guys (in cooperation with our amazing Genesis theme and Synthesis WordPress hosting crew) built a bunch of custom magic behind-the-scenes. Probably my favorite is the podcast widget, which automatically scrapes the headline of each new podcast blog post, automatically inserts that headline and the featured image, and instantly creates and uploads the podcast promotional graphic that appears on the left side of each blog post. Robots rule! Speaking of the podcast, our guest a couple weeks ago (one of our best episodes ever, by the way) was Brian Clark from Copyblogger. He explained why they pulled comments off of their blog, and I said on the show that we are considering doing the same thing. We haven’t pulled them off yet (obviously), but we may yet. We find that the best interaction with our content often occurs on other platforms (like G+) and I’m not necessarily troubled by that. We’ll see. I can’t wait to see what the impact of this new design is on our analytics. What do you think of it? Thanks as always for your support!